This product has new, the contour practical and so on many patents, the contour is novel, overall health, environmental protection energy conservation. This product execution country standard GB/T 14,466 and enterprise standard Q/WSS01-2004, is the domestic origination. This product high-quality [ overall stainless steel health level ] or the popular type [ organism uses stainless steel ] . This product matches the vertical type motor, organism and the electrical machinery joined bodies coaxial structure, therefore calls continually the writing style colloid mill. This product is equipped with the platoon to suppose keeps off the water plate, the operation use simply, installs the maintenance conveniently, the volume is small and so on the characteristic. 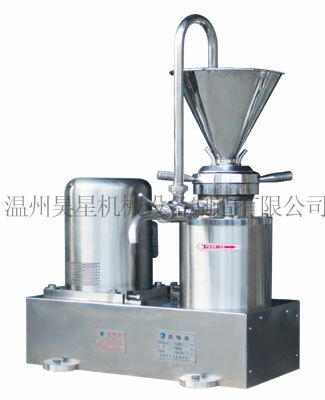 Grinds, the smashing, the emulsification, the mix, the disperser for the wet type ultramicron, isotropically, stirs the contour effect function. Is suitable in each kind of liquid state shape medium material, the processing material sticks the density to be supposed to be smaller than 10,000 centipoise medium. May defer to the customer to process nature special request and so on material different acidity, alkalinity, thick thickness has custom-made the production. May replace and surpass the stone mill, the sand blast machine, the ball mill, the breast is uniform, stamp mill work and so on machine, mulser, three rollers machine. In the processing material does not allow to mix has the quartz sand, the glass fragments, the sweepings and so on the hard matter, strictly prohibits entering the colloid mill processing production. It start, close it and can't start the machine before not washing, after the colloidal to rub there aren't organism , forbid dallying and reversing. Otherwise operate improper to can damage hard quality mechanical package or quiet mill , move mill or take place leakage burn electrical machinery ,etc. trouble seriously.